I haven't been real lucky lately with the timing of beer drinking events in regards to my being out of town. Next weekend appears to be no exception. 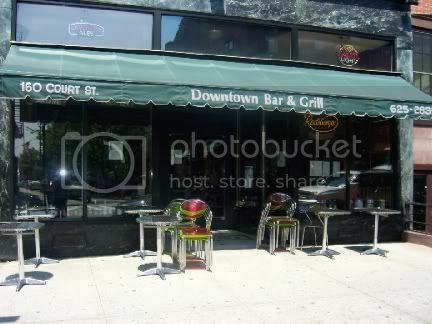 I was walking by the Downtown Bar and Grill, located on Court Street and Amity not far from where I live. This used to be Cousin's II and I haven't been in it since it changed hands and dramatically increased the number of beers they have available. They have hundreds now. I would have stopped in to see what they had but I was a bit early so it wasn't open yet. One day soon though. I spotted this in their window though and my heart sank when I realized I would miss it. I am heading for Costa Rica early Saturday morning and won't be back until after this is over. It starts on Thursday, May 31st and ends on Saturday, June 2nd. The beer starts flowing at 6 PM each day. This is not for lightweights. The alcohol content of these bad boys runs from a low of 9% (Stoudt's Fat Dog Stout and Allagash Triple Ale) to a high of 12.5% (Weyerbacher Blasphemy). I would probably fixate on the Weyerbacher Blithering Idiot just because I like the name. To get over my disappointment I stopped in at American Beer just up the street a few blocks and bought a bottle of Harvestoun Bitter and Twisted Ale. 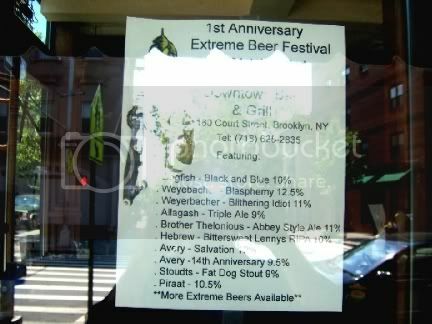 American Beer is off-sale only but it has one of the most amazing selections of beers you will ever find. The prices are fairly competitive as well. One day I will write more about this place. I am very lucky to have this place in my neighborhood. If Mister Rogers had it in his neighborhood his show would probably have been more like Pee-wee's Playhouse. Harvestoun Bitter and Twisted Ale is made in Scotland and Harvestoun also makes the delicious sounding Old Engine Oil, a dark beer. I guess I will have to try it one day. 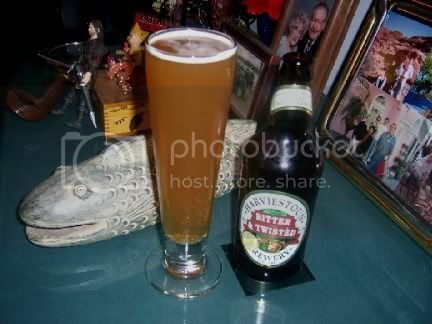 The Bitter and Twisted is a nice light and refreshing beer with a crisp cirtrus flavor to it. The Twisted part of the name comes from the allusion to a lemon twist, although I didn't find any overpowering lemon flavor. Guess this is yet another example of a brewery fruiting their beer, man rules be damned. I won't be posting until I get back from my trip. I just don't feel like lugging my laptop with me this time around. Keep alert though, I hope to have some interesting stuff for you when I return.